Nov. 10 marks 12 months since the college officially began its pursuit of Living Building Challenge (LBC) status for the Class of 1966 Environmental Center. The results are in: The building has met all but one of the seven rigorous requirements for full certification—that of using only the energy it produces and collects on-site. Those involved in the project will submit data for the six other performance areas—beauty, equity, health, materials, site, and water—to pursue partial LBC certification in the spring. Meanwhile, they’ll be implementing changes and tracking data for a few more months in an effort to sustain 12 months of operation at net-zero energy and eventually achieve full certification. The LBC, administered by the International Living Future Institute, is the most stringent measure of sustainability in the built environment. To receive certification, a building must demonstrate that it can live within its means, using only the electricity produced and water collected on-site and devoting 35 percent of its landscaping to food production, among other requirements. “We didn’t expect it to be easy,” says Mike Evans, assistant director at the Zilkha Center for Environmental Initiatives, which, along with the Center for Environmental Studies, has its home in the Class of 1966 Environmental Center. Currently, only 11 buildings in the world have received full LBC certification. 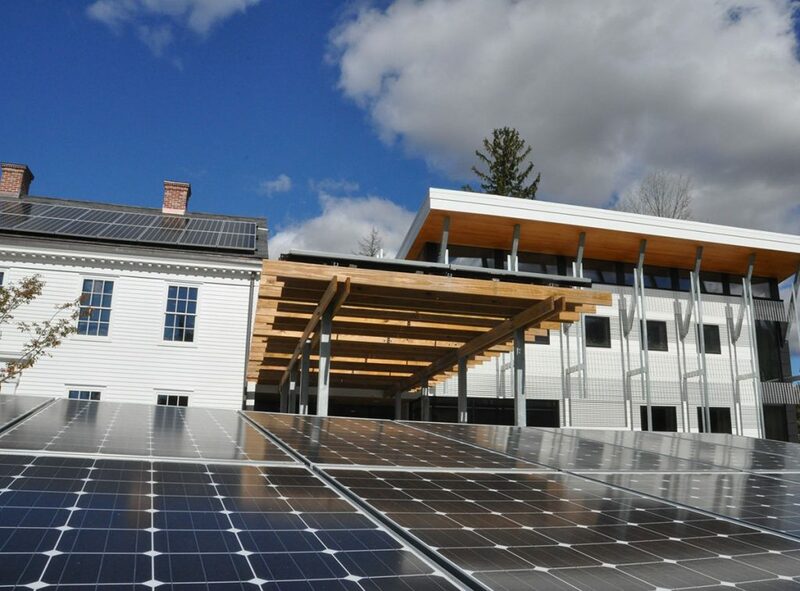 With heavy use of the center’s classrooms, kitchen, library, and meeting spaces expected from the outset, Williams approached the challenge of net-zero energy as a learning opportunity. When data showed higher than anticipated electricity use, in part because appliances were occasionally left on in the kitchen, the Zilkha Center began requiring training sessions and card-swipe access to use them. Meanwhile, architects and engineers who have worked on other LBC projects are consulting with the Zilkha Center to determine why energy consumption continues to outpace production—and how best to address the imbalance. And though the building is meeting the LBC’s water requirement—with use lower than expected—students and staff are continuing to study and refine the filtration system. All water used in the building comes from rainwater collected in an underground cistern, which must be treated. But filters have needed changing more frequently than anticipated. Some of the building’s features have brought unexpected benefits. Rain gardens were built around the center to collect rainwater and slowly return it to the ground in an effort to avoid flooding of nearby college housing and Sawyer Library. Though water infiltration has been slower than expected, creating ponds, the gardens have prevented flooding. And the ponds themselves have attracted wildlife, including frogs, turtles, and ducks.